Usually, no matter how tired I am and even if my husband is away, I still enjoy making dinner. I enjoy experimenting with ingredients, herbs and spices. Sometimes, I DO have to admit, I’ll make a large meal and eat it forever if he’s on a long trip. He’s a Captain for a major ( the BEST airline) , and travels internationally and is away often and can be away for somewhat long periods of time. I DO have a “food saver” and that is a magnificent machine. You can truly preserve just about anything. You can freeze meals and reheat by boiling the bag, or simply use the airtight system for quality freezing. But tonight, I was sidetracked, playing with the puppies, and I cleaned out my so called garden and headed to Lowe’s. I purchased this seasons new herbs and am going to give a go to some zucchini, squash, and I THOUGHT I was getting a strawberry plant, but it turns out to be a tomato. ( ummmm hmmmm, I know my stuff eh?) Don’t get me wrong, I LOVE tomatoes, I just don’t want to grow them. I’m a bug- a -phobe and no matter how hard I try, there will ALWAYS be those gross caterpillars on any tomato plant I have. I simply want to avoid that. But, I have it, I love tomatoes, and I just hope hubby will be home to save me from the tomatopillers! So, when I was done it was around 8:30 and I didn’t want to cook, but I was hungry. As I said, it was a busy day. I looked in the fridge, and I thought, grilled cheese! I haven’t had one of those since…. well, I can’t even recall. I had a few other ingredients that seemed like they might work together, and they did. Simple, quick, delicious. 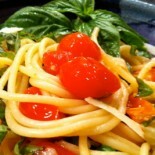 Great for lunch or a quick simple supper. What do you have in your fridge that will work? Try it! 2 slices bread. I used Arnold 100% whole wheat sandwich thins. I like crusts. cooked asparagus (left over roasted) artichoke, kale, spinach just popped in my mind and would be great also. Heat pan over medium low heat, lightly spray prosciutto with olive oil and heat till crispy. 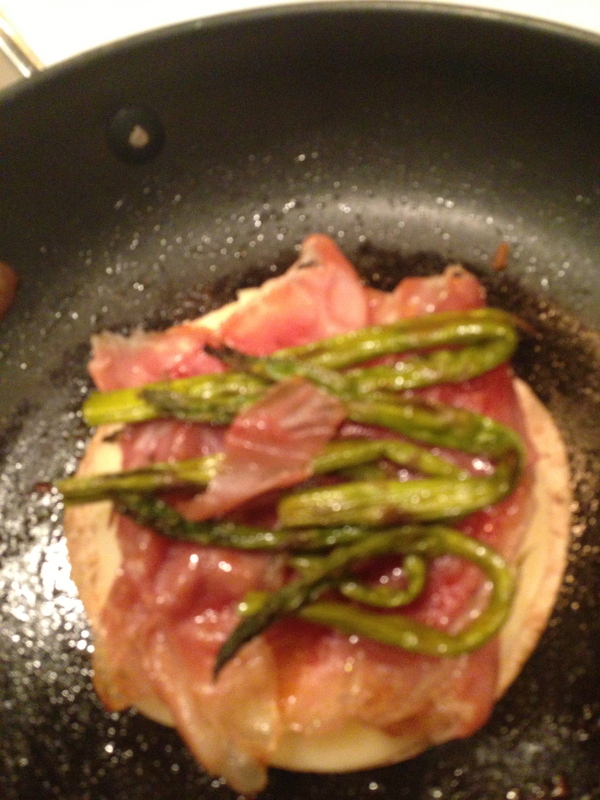 Reheat asparagus, or whatever green you will be adding along with the prosciutto. 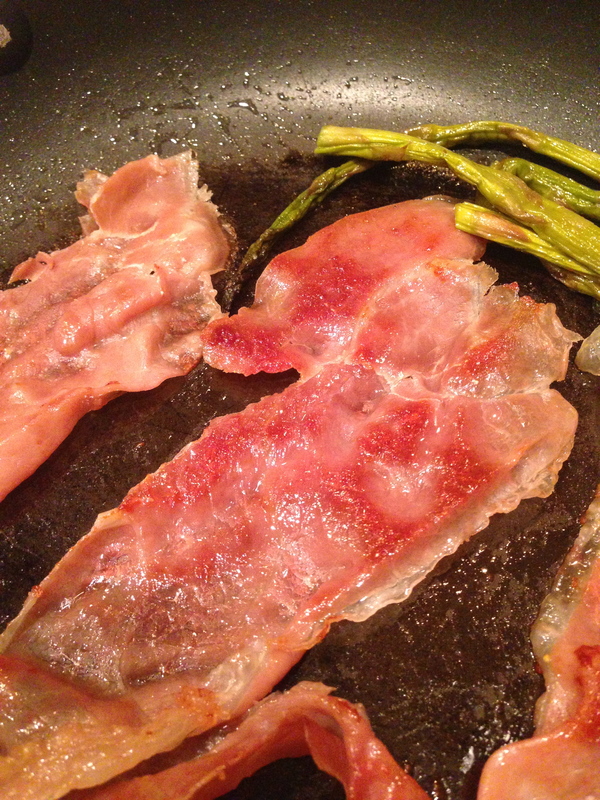 Remove from pan when prosciutto is crispy and vegetable is warmed. Place on slice of bread in the pan, buttered side down. Spread some Dijon on the unbuttered side. Place a slice of the provolone, or whatever type of cheese you have on the bread. Place the crisped prosciutto, and vegetable, and top with another slice of cheese, and top with the remaining slice of bread, buttered side out. You could add some more dijon on the unbuttered side if you’d like. Cook over medium low heat for about 3 minutes, turn and cook 3-4 minutes longer, until a crust is a golden brown and cheese has melted into a gooey delight. 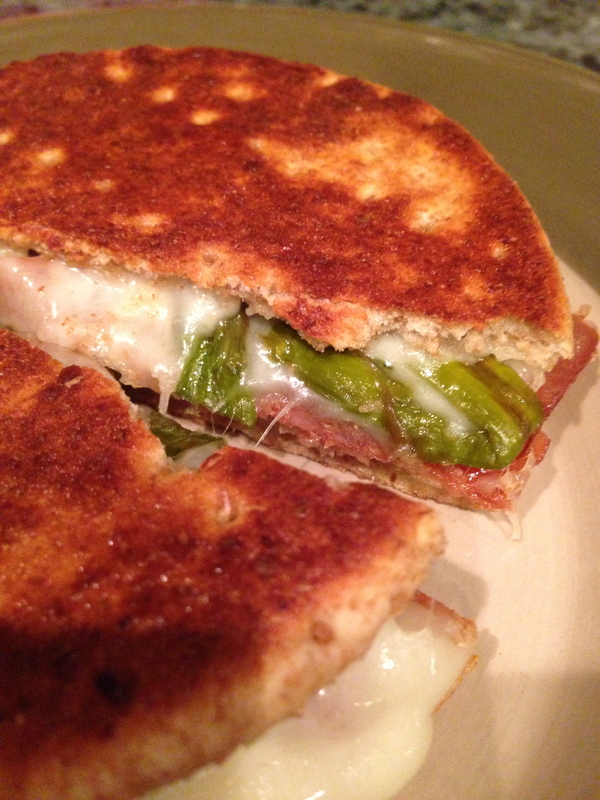 This entry was posted on May 27, 2013 by barbaralandfair in lunch, quick & easy light supper, snack and tagged cheese, easy, grilled, light, lunch, proscuitto, provolone, quick, supper, vegetable. sandwich.